I’m cooking a piece of pork in the oven with apples off my tree, fennel seeds that I harvested from my out-of-control fern before I cut it back and fresh sage leaves. I needed splash of wine and remembered the sample bottle of Matawhero Church House Gisborne Chenin Blanc 2016 that arrived by courier the other day. To me Chenin Blanc and apples are peas in a pod. The apple is one of those flash identifying descriptors that helps pinpoint the variety immediately (thanks wine appreciation 101 ~1990). And apple aromas and flavours are simply overflowing from this wine. I steal a piece of apple that I put in the pan to pick up the goodies from rendering down the pork skin. The Chenin Blanc taste is not cooked apples; it’s definitely fresh, crisp heritage apples like the ones off my tree. I bite into a fennel seed. That awesome aniseedy taste – what a great match. So the pork is in the oven now at 150 degrees C for a couple of hours and I can focus on this single vineyard wine. The crisp apple flavours are honed by a textural complexity that I would usually put down to the use of old barrels, but the technical notes don’t indicate the use of oak in this wine. Perhaps it is just the nature of Chenin Blanc, anyway whatever it is it softens the upfront raciness and settles gently as it flows. One thing that really strikes me is the dryness to the finish. So while the fruit rounds out the palate, the flinty / limey/ sucking-a-river-pebble dryness that envelops it really begs for food, then the lingering fennel seed anise-y taste and suggestions of honeysuckle endear me, like it does with many steely, racy aromatic whites. And those lingering gunsmoke notes. Amazing. Chenin Blanc is not well known in New Zealand. It used to be back in the eighties and then it became a key ingredient for cask wine swill. Now there are very few followers of this fashion. But those that do make it like Matawhero and Millton (Gisborne), Esk Valley (Hawkes Bay), Margrain (Martinborrough), Forrest Estate (Marlborough) and Amisfield (Otago) are respecting the grape that does so well in our country while paying respect to the benchmarks from Vouvray. Chenin Blanc is a high acid white that has the legs for aging. I’ve love to taste this again in another 10 years. The pork takes a couple of hours to cook and it’s prep for tomorrow night, so I’m putting the cap back on the Chenin and will try the wine again then. 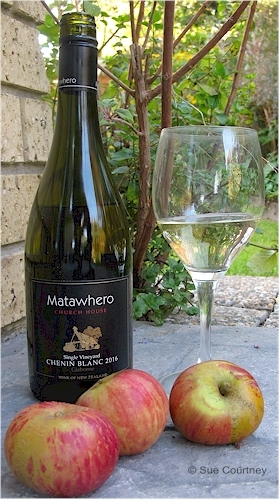 Matawhero Church House Chenin Blanc 2016 has 13.1% abv, 6.44 g/l TA, 3.53 pH, and 5.23 g/l residual sugar. It costs around $25 a bottle. Check out matawhero.co.nz for more. Update March 24th: Not a match for the pork. Apple overkill. But biting into a baked fennel seed definitely divine. This entry was posted in #nzwine, chenin blanc, gisborne, NZ regions and tagged 2016, Matawhero by Sue Courtney. Bookmark the permalink.